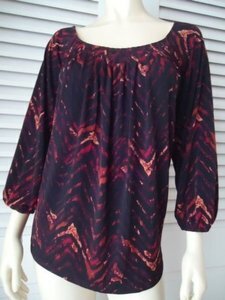 Stretch Polyester Slinky Knit Pullover Top by MICHAEL KORSFabric is a multi-colored abstract printFront Neckline is Pleated giving top a full effect in front3/4 Raglan SleevesWide Rounded NecklineTRAVELS GREAT!!CLASSY!! CONDITION Gently worn. FLAWS/DEFECTS None.